Source: CICH graphic created using data adapted from Statistics Canada – 2016 Census. Catalogue Number 98-400-X2016155. http://www12.statcan.gc.ca/census-recensement/2016/dp-pd/dt-td/Rp-eng.cfm?LANG=E&APATH=3&DETAIL=0&DIM=0&FL=A&FREE=0&GC=0&GID=0&GK=0&GRP=1&PID=110588&PRID=10&PTYPE=109445&S=0&SHOWALL=0&SUB=0&Temporal=2017&THEME=122&VID=0&VNAMEE=&VNAMEF= – Accessed December 23, 2017. Children under 5 make up a greater proportion of the Indigenous population than they do of the non-Indigenous population in Canada. 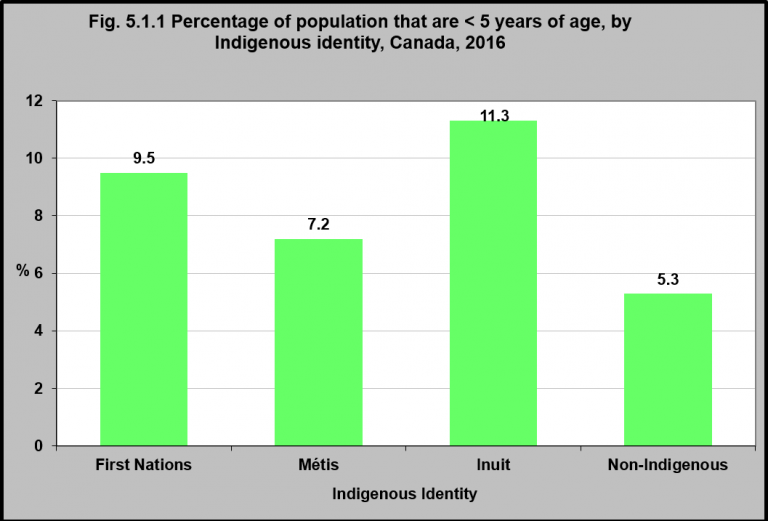 10% of all First Nations people in Canada are less than 5 years of age, as are 7% of Métis and 11% of Inuit peoples in Canada. Among the non-Indigenous population, only 5% are under 5. The Indigenous population in Canada is younger than the non-Indigenous population. The Indigenous population is also growing substantially faster than the rest of the Canadian population; however growth rates vary among Indigenous groups due in part to differences in fertility rates and changes in self-reporting of cultural affiliation.1 With this growing youthful population, there is a need to prioritize interventions aimed at improving the health and well-being of Indigenous children 0-4 years as critical for strengthening Indigenous families and communities.